Here's the thing, though. EA hasn't confirmed a 'Street' mode being in the game, despite it being released next month. And numerous journalists and YouTube influencers have had three days' worth of access to the game behind-the-scenes at Gamescom, yet none report sighting it there either. 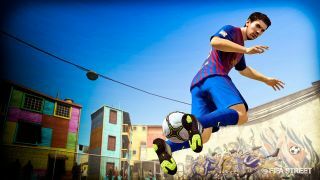 Here's my conclusion: you will get to play some form of street football in FIFA 18, but only as part of The Journey 2. EA has already hinted as much by confirming that Alex Hunter's new storyline takes you to Brazil, despite the fact the EA doesn't own the licence for Brazilian players. So you will get to play in the favelas of South America – but won't be able to pirouette your way across Oxford Street as Neymar, Messi and/or Josh King. Sorry to disappoint. As someone who has repeatedly put on record my desire to see FIFA's indoor mode make a comeback, I hope I'm wrong. FIFA 18 is released for every console imaginable, and PC, on 29 September. For more, check out our detailed FAQ based off an extended hands-on.